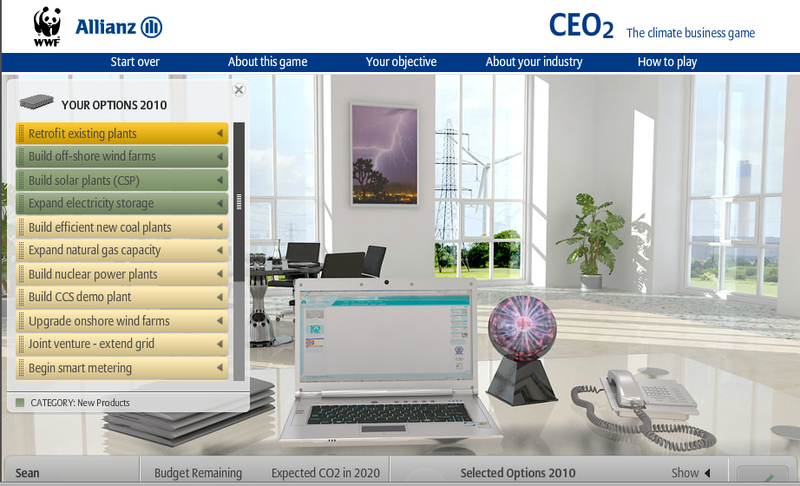 CEO2 is an interesting and robust simulation from the UK challenging us to successfully run a company while reducing its carbon dioxide emissions. I wanted to mention it here because of our proximity to Earth Day, and also because this web-based interactive (Flash-based, so iPad-unfriendly) relates to language skills, curriculum and schematic information that would benefit upper elementary, middle or high school students. The desktop portfolio contains the possible options for the CEO in various categories. 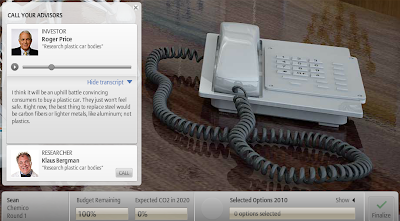 Dragging any option to the computer gives more information about it. Dragging it to the "Selected Options" means you have chosen it for the game (with the goal of selecting enough options so that you have spent 75% of your budget). Note that the decoration on each CEO desk, when hovered over with the mouse, presents a whole bunch of idioms related to the situation that you can discuss with students. In perhaps my favorite aspect of this simulation as an SLP, dragging an option to the phone allows you to "call" two contacts and hear their opinion on the matter. Information is presented auditorily (so, to provide a good context for listening strategies), but a transcript is provided. Though complex in terms of the information one has to grapple with, the game is pretty simple. Select a number of options, click Finalize and see results in terms of one's stock price and carbon dioxide emissions, in an easy-to-read chart. The activity, as well as promoting environmental awareness, relates to science and social studies curriculum, provides a rich source of vocabulary, and asks students' to comprehend multiple perspectives on an issue. It would be a great activity to make an accompanying tracking sheet, such that students can simply note the options they choose, the results, and infer reasons why it worked out that way. 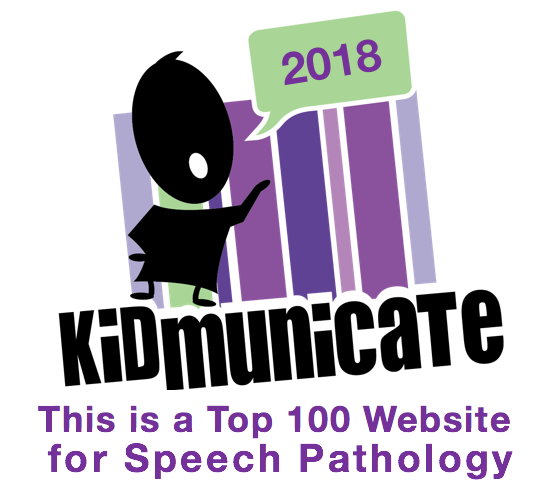 It certainly is an activity in which an SLP can provide a lot of scaffolding to help bridge students' understanding and use of the concepts involved. School vacation week is next week in MA- see you soon!